Berlin, September 13, 2012 – Native Instruments today introduced a new collection of high-end effects, capturing the warm, natural sound of tube-driven hardware. PREMIUM TUBE SERIES is made up of three individual effects – PASSIVE EQ, VARI COMP and ENHANCED EQ – available either individually or as a high-value bundle. PREMIUM TUBE SERIES makes these effects available for the first time as native plug-ins that run individually within a DAW in VST, AU, RTAS or AAX format. The effects are modeled by Softube, the renowned team behind Native Instruments’ VINTAGE COMPRESSORS. PASSIVE EQ is a fully-parametric, two-channel, four-band equalizer, with additional high and low pass filters plus a wide collection of presets for all use cases. Characterized by its versatile nature and natural sound, it is well suited to a wide range of production duties – from individual tracks to sub groups and even mastering. As with all the effects in the series, running as an individual plug-in in any DAW gives it significant ease-of-use advantages over hardware units, such as built-in parallel processing options, and mid/side mode. As its name suggests, VARI COMP is a compressor with a flexible range of use cases, from instrument groups to individual tracks. Emulated to possess a clear and warm ‘analog’ sound, VARI COMP limits and compresses. In limit mode, it uses a unique automatic ratio and knee adjustment, altering the compression ratio from 4:1 up to 20:1 automatically in response to the input signal. 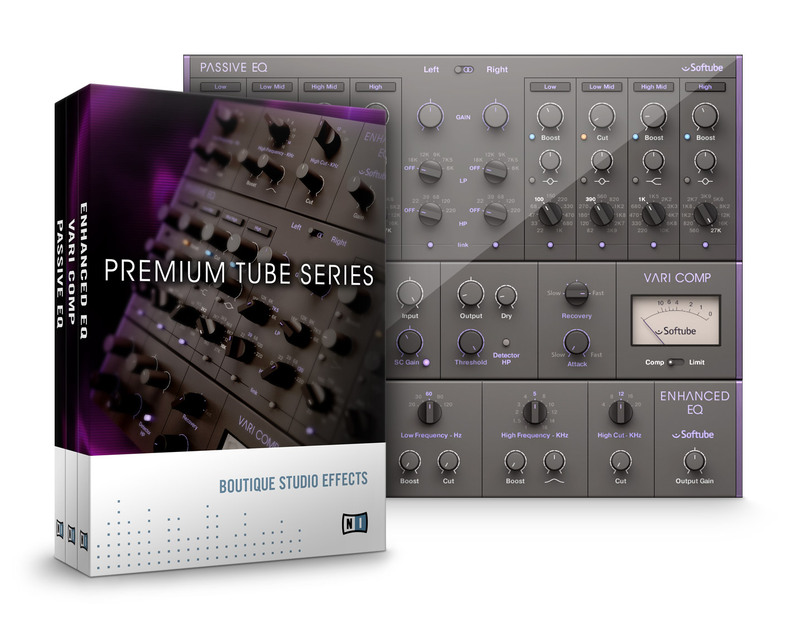 The PREMIUM TUBE SERIES bundle is available at the NI Online Shop for $229 / 199 EUR. The individual effects can also be bought separately: PASSIVE EQ $169 / 149 EUR, VARI COMP $119 / 99 EUR, ENHANCED EQ $79 / 69 EUR.